The conversation today – and every day – revolves around the value of tradition; traditional food prep and storage, traditional cooking, the new traditional farming practices, and of course, traditional artisan CHEESE. Topics discussed here are designed to create new perspectives and possibilities for how you might add the taste of tradition to your life. It’s snowing again today. Sigh. Will this winter never end? The trough drains used to carry waste away from cows doing their thing during milking has a brand new cover. It is covered with molded fiberglass resin floor grates. These are strong, non-slip, non-rust grates; and they look pretty cool to me. Walls in the creamery are going up, slowly. Very slowly. It is still winter and the weather is impeding our progress there. A regular winter task is pruning the fruit and nut trees in the orchard, trimming and repositioning canes in the blackberries and so on. Done!! We will be trying a new method of separating calves from moms this year. We need a calf pen to accomplish that. We eat a lot of eggs around here but raising chickens is still on the back burner. Instead we are going to raise quail for eggs and likely some meat as well. This decision is based on time restrictions in building the chicken infrastructure. Making quail cages is much quicker. The birds are easy to raise. Or so they say. We shall see. This is my project. Scott will build a couple of cages, but everything else will be up to me. The incubator is on its way. It will be here later this month. Now let’s take a very quick trip through thousands of years of history. How did we humans survive as a species? What kind of food did we eat and how did we preserve and prepare it? How did we get to where we are now? Let’s start with the Stone Age shall we? During the Stone Age, the Paleolithic period, or Old Stone Age (beginning as early as 750,000 BC), and the Neolithic period, or new Stone Age (beginning around 8000 BC), humans began to make and use stone tools and acquire a larger variety of foods in new ways. Paleolithic tools include axes and blades for cutting and chopping. In order to survive during the Paleolithic period, humans hunted wild animals, birds, and fish and collected nuts, fruits, and berries. Artifacts show that people ate mammoth, reindeer, horse, fox, wolf, and tortoise. Cooking techniques included broiling or roasting food over an open flame or hot coals. Brazing in clay cylinders over ashes in a pit is also indicated. One of the most significant changes in human food habits occurred around 8000 BC, when people in the Near East began to grow food rather than gather it. This is the Neolithic period. Humans started raising cereal crops such as rye and wheat. We began keeping livestock, including pigs, cows, goats, and sheep. Archaeologists have discovered millstones in these areas, an indication that Neolithic peoples were grinding wheat and other grains to make flour for bread. Advances in food production and preparation in early civilizations had a broad reach. People in Northern Europe began to farm sometime after 3000 BC. Farming practices advanced with the invention of the plow around 3550 BC, and food production increased. In the Bronze Age, which began around 3000 BC in Mediterranean areas, people began to cook using liquid in pots made of copper and bronze. New tools and utensils also became available. We were figuring out what it took to survive as a species. Banding together in larger and larger groups led to the early civilizations of Mesopotamia and Egypt. These two civilizations shared some food habits and traditions. Although beef, lamb, pork, deer, fowl (excluding chicken), fish, turtles, vegetables, and fruits were all part of their diet, grains were a staple food. Besides cooking cereals in water as a porridge and using ground grains to make bread, the Mesopotamian’s favored beer as a beverage for festive occasions. Inscriptions on Egyptian tombs — “give me bread when I am hungry. Give me beer when I am thirsty” – bear witness to the heavy use of grain in the ancient Egyptian diet. Both the Mesopotamians and the Egyptians developed a system of writing early on and thus had the means to record recipes. The first known recipes come from Mesopotamia and date to the second millennium BC. Excavated tombs have yielded remnants of foods such as figs and bread, which were typical funerary offerings. Ancient Egyptian food preparation methods such as open hearth baking of unleavened bread and salt preservation of meats and fish are still common today. The Egyptians also dried and smoked foods and stored fruits in honey and fish in oil to preserve them. As I mentioned in the History of Cheese FarmCast, the Greeks made cheeses. They also baked bread and produced wine. They became skilled in the use of seasoning and spices, made sauces using oil and cheese, and cultivated olives. Meat, such as rabbit, was added to the diet and gained popularity. Influenced in large part by the ideas of the great physician and teacher Hippocrates (ca. 460-377 BC), the Greeks, and later the Romans, focused on eating a healthful diet. Consuming food items for both medicinal and nutritional purposes, they viewed cooking methods, combinations of foods, drink, and seasonings as contributions to overall well-being. The Greeks introduced a tradition of lavish dinner parties or banquets, which were often followed by a symposium, the ritual consumption of wine. In the typical Roman kitchen, the master cook supervised food preparation from a platform at the rear of the room. Square hearth fires stood in the middle. Kitchen equipment featured pots made of bronze, brass, clay, or silver, as well as wood-fired ovens. Formal dining traditions were further developed during the Roman Empire. Roman traditions continued to dominate cooking and dining practices through the Middle Ages. During the Renaissance, advances in the culinary arts helped set the stage for the development of modern cookery. Medieval kitchens typically stood apart from the main house to reduce the risk of fire. The traditional kitchen was crowded, noisy, hot, and smoky. Vents in the ceiling allowed the release of smoke and heat from the roasting spit and simmering iron kettles. Cooks kept food cold in cellars. Kitchen equipment included iron pots as well as various hooks, spoons, and knives. The Iron Age produced the cauldron. An iron vessel hanging from a metal arm over hot coals, was the main cooking pot. The typical chimney hearth could accommodate three cauldrons. The cauldron on the left side of the hearth was used for roasting, and the others were used for boiling. Breads and pies were baked in an oven on the side of the chimney. The late 1300s marked the beginning of the Renaissance, an era of revival in the arts and sciences that spread across Europe from south to north. Italy dominated the culinary scene in the 1400s. By the end of the century, it had shifted to Spain, whose explorations and conquests in the Americas introduce new foods and methods of food preparation into Europe. Christopher Columbus and Hernán Cortéz as well as other explorers and conquistadors returned to Europe with tomatoes, chili peppers, potatoes, avocados, corn, vanilla beans, and cacao, the main ingredient of chocolate. These food items had a lasting impact on European cuisine. By the late 1500s, France rose as Europe’s culinary center. Let’s move on to America. While grand cuisine was taking shape in France, American cuisine was only in its infancy. There were no cities. European settlers in the Americas brought familiar cooking methods and some staple foods from the old world with them and combined these with culinary techniques and ingredients they found in the New World. From the start, American cookery has been a mosaic of ingredients and techniques from a variety of cultures. When Columbus arrived in the Americas in the late 1400s, most Native Americans followed traditional practices. Their main crops were maize (corn), beans, and squash, but other valuable crops included potatoes and sweet potatoes. Domesticated animals were not a large source of food. However, in addition to cultivating crops, Native Americans fished, hunted, and collected other foods. Remember they were still in the Stone Age as far as their tools and equipment were concerned. They devised storage pits for grains, nuts, and other foods, used a variety of cooking techniques, including roasting and boiling in pots, and preserved some foods by drying and smoking. Again, refer back to the information on Stone Age cooking and tools. European settlers learned a great deal from indigenous peoples about growing and preparing foods native to the New World. Native Americans taught newcomers from Europe the most efficient ways to cook outdoors and how to prepare beans and corn. Corn breads, succotash, and various soups and stews became part of the colonial cooking repertoire. For their part, Europeans changed the food supply in the Americas, introducing livestock such as pigs, cattle, and sheep, and plant food such as rice, wheat, barley, and broadbeans from Europe. Soon colonists were comfortable preparing a variety of foods using a blend of Native American and European techniques. During the vast land expansion in the 19th century, the American diet began to show variety from one geographic region to the next. Each part of the country developed its own regional cuisine – foods, ingredients, and cooking methods characteristic of that particular geographic region. Several factors contributed to the development of regional cuisines, including availability of local ingredients and the influence of cultural groups. Immigration the 19th century changed America as cities began to flourish. Nearly 5 million immigrants arrived in the United States in the period between 1830 and 1860. That’s just 30 years. Most were from Germany, Great Britain, and Ireland. Two waves of immigration after 1860 brought people from Scandinavian countries and from Italy, Austria, Hungary, Russia, Greece, Poland, Portugal, and Spain. Asian immigrants also began to make a home in America’s big cities. The various regional cuisines began to take shape. The Northeast was influenced by Native Americans, Englishmen, French-Canadians, Italians, and the Portuguese. Some of the regional foods they developed include meat pies, fish stews and soups, clam chowder, salt cod, chorizo and peppers, baked beans, succotash, Indian pudding, brown bread, maple syrup, cider, fruit pies and desserts, and cream dishes. Later cheese would become a valuable product for this region. In the Mid-Atlantic schnitzel, scrapple, sausages, apple butter, sauerkraut, slaw, pretzels, bagels, waffles, pork, and dairy products came out of the Dutch and German influences. Moving to the Midwest we find jerky, country hams, sausages, gravies, beef stews and pot pies, meatloaf, corn roasts, freshwater fish, cheese, potatoes, root vegetables, rye and pumpernickel bread, wild rice, pancakes, strudel, applesauce, apple juice, sauerkraut, nut candies, poppy seed cake, and lager beer. Influences there include Native American, Polish, Hungarian, Czech, German, and Scandinavian. The southern region is large and varied. Brunswick stew, country hams, red eye gravy, corn breads, biscuits, barbecue pork and beef, chicken wings, jambalaya, fried chicken, crab cakes, crab and crawfish boils, catfish, butter bean custard, peanut soup, peach pie, key lime pie, greens with fatback or salt pork, fried okra and okra stews, hominy, grits, gumbo’s, sweet potato pie, nut cakes, and rice. This wide variety is due to Scots Irish, English, Welsh, French, Creole, Cajun, and African influences. The west is even larger and more varied in its immigrant influences introducing cuisine from the Far East. What a variety. Native American, Spanish, Mexican, Chinese, Japanese, and Pacific Islands all contributed. Today you have barbecue, corn dishes, Tex-Mex food, chili con carne, citrus fruits, guacamole, olives, tuna, sourdough bread, steaks, game, grilled lamb, teriyaki, luau pork, salmon chowder, sashimi, fry bread, Asian noodle dishes, stirfry dishes, tortillas, tacos, quesadillas, chimichangas, pineapple, sugarcane, and chilies prepared and used in all sorts of ways. New ideas and technology in the 1800s had a great impact on agriculture and industry. Established cities were growing rapidly. Today it’s the trucking industry but back then it was the trains that were paramount to people in the city having access to food. Improved tools; new farming methods; and the development of various farm machines, including tractors, combines, and cultivators, increased the supply of food while decreasing the need for small farmers. The 19th and 20th centuries were a time of great change in the United States. The Industrial Revolution introduced machines that transformed farming and manufacturing. Large numbers of people continued to move to the city. The move from rural areas to the city accelerated and fewer and fewer farmers grew our food. The supply of food increased exponentially but more and more people became separated from the source of their nourishment. Electricity, gas, and the creation of modern appliances were the icing on the cake. Harvesting, storing and preparing food is a breeze today compared to days past. I took you through quite a journey very quickly. We went from primitive stone implements right up to modern cooking and preservation equipment. I want to step back a little and fill in a blank or two regarding cooking in early colonial America. Specifically regarding baking bread on the hearth. It will tie in with today’s recipe. As part of the ritual of good food provided in plenty by wealthy Virginians, an array of well-made breads was essential. They were brought to the table to be slathered with fresh butter and eaten still warm from the oven. Let’s consider how formidable it was to make bread. There were no handy grocery stores to pick up a loaf on the way home, no packets of dried yeast. Preparing and baking bread was a time-consuming, arduous process, from making yeast to knowing when the oven was ready. Commercial yeast was not available until 1868, and recipes for yeast occupy a large part of the breadmaking sections in early cookbooks. Cook’s kept a starter on hand, made with ingredients that included hops, potatoes, sugar, flour, and water. Combined with more flour to make a “sponge,” the dough would be set to rise hours ahead of when it was to be eaten. Kneading was (and still is) a major part of the process, and its importance was emphasized. A Mrs. Smith, writes that “the best bread makers who I know knead for at least an hour, with all their might…” Eliza Leslie noted that “the goodness of bread depends much on the kneading.” While Miss Leslie’s statement holds true today, those lengthy times required for kneading are no longer necessary. The commercial yeast now available has shortened the process considerably. The actual baking was done in Dutch ovens or brick ovens built into the huge kitchen fireplace. A thorough knowledge of the process was vital. Alternatively, with Dutch oven baking it was necessary to preheat the iron kettle before putting in the prepared bread dough. Once filled and covered, the Dutch oven could be suspended from a crane and hung over the fire. Another method was to set the Dutch oven on coals to bake in a corner of the hearth. Additional hot coals were piled on top of the lid. Let’s take a look at a colonial bread recipe and talk about how it would be prepared in a Dutch oven on a hearth. “Rub a piece of butter the size of an egg into a pint of cornmeal, make a batter with two eggs and some new milk, add a spoonful of yeast, set it by the fire an hour to rise, butter little pans and bake it.” Mary Randolph. This is typical of recipes of this era. Simple measurements of weight or volume, vague measurements such as a spoonful or “some” milk and so on, or no measurements at all. Which spoon? And what constitutes a “little pan”? You really had to know what you were doing. I just happen to have this recipe complete with a modern list of ingredients. You’ll be able to give it a try with confidence. The instructions for baking this bread on the hearth will be there for you as well – just in case you want a really big adventure in baking. Heat butter and milk until milk is warm and butter begins to melt. Set aside to cool to lukewarm. Combine cornmeal, yeast, and salt in bowl. Stir in cooled milk and butter. Beat eggs lightly and stir into rest of ingredients. Blend well but do not overmix. Pour into well-greased baking pan and set aside to rise one hour. Carefully place filled pan in preheated Dutch oven on trivet, crane or hearth stone ashes. Bake, following general instructions for Dutch oven baking, for about 25 minutes, or until knife inserted in center comes out clean and bread is a rich golden brown. NOTE: I’m not including the “general Instructions for Dutch oven baking”. Email me if you want those instructions. Follow hearth directions one through four, using 8” x 8” square pan. Preheat oven to 450°F. Bake cornbread 20 to 30 minutes or until done. I hope you enjoyed today’s FarmCast. We will keep plugging away at that creamery and living the life that fills us with wonder and awe. 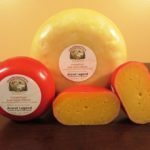 We love our cheese and can’t wait to share it with you. Run on over to www.peacefulheartfarm.com to see what we’ve got cooking for you there. 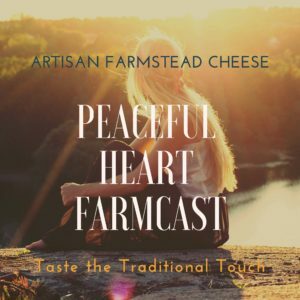 Every one of the recipes you hear on the FarmCast is there as well as many others. Sign up on our mailing list so you can receive our monthly newsletter filled with more cooking tips and tricks. From the basics of how to boil an egg – in an Instant Pot – to creating really fantastic and fun dishes like that cheese fondue recipe. I’m going to shamelessly plug that. We had it just last week. It was a lovely romantic evening. While our creamery is modern, the methods we use are not. Striking that balance between using the traditions of yesteryear while taking advantage of modern technology is the best of both worlds. Life in ancient times or even just a couple hundred years ago was filled with all sorts of dangers and pitfalls. Food was scarce. It required lots of time and effort to prepare it. Tradition was extremely important. Tending your hearth properly meant the difference between living and dying – or at the very least losing everything you owned in a fire. Without modern food preservation, effectively using traditional techniques of preserving food were also the difference between life and death. The art of having safely prepared nutritious food year round meant you and your children might live to a ripe old age. Cheese making was a big part of food preservation. As were drying, pickling, smoking and salting. These ancient food preservation techniques made living through harsh winters possible. It’s so easy to take for granted what we have today and what we have endured to get here. I will speak on behalf of Scott and myself. Gratefulness fills our hearts as we reflect on the old ways. We look forward to continuing to share our passion for preserving life with you.